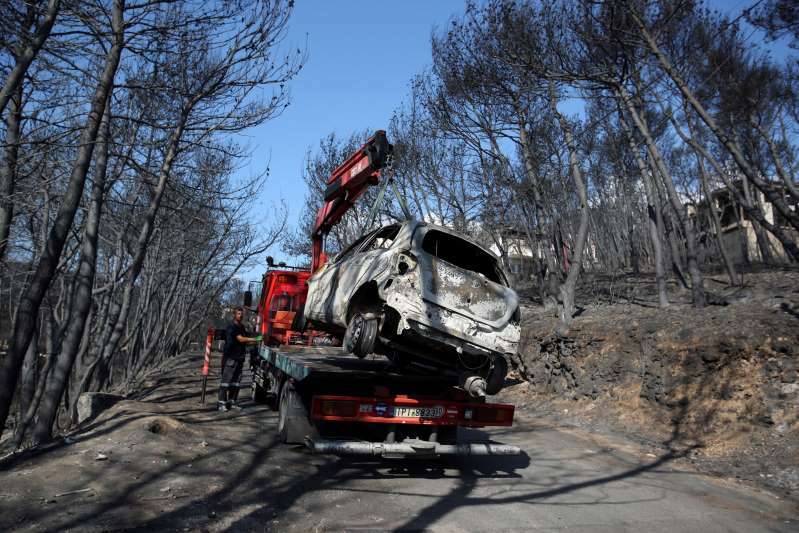 Funerals for the victims of Greece's lethal wildfire began Saturday with the burial of an elderly priest who drowned as he sought safety from the flames in the sea off the coastal community of Mati. Hundreds of people attended Father Spyridon Papapostolou's funeral in his parish of Halandri, a northern suburb of Athens, the Greek capital. Papapostolou, his wife and daughter were among hundreds who entered the water to protect themselves from the fast-moving flames. But the 83-year-old cleric passed out and drowned, while his wife and daughter survived. [post_ads]"Father Spyridon was certainly ready for this trip, but not in this way, he didn't deserve it," his niece, Ifigenia Christodoulou, told The Associated Press. "I hope that he prays for all us from up there, just as he has done all these years." Dimitra Bavavea directed her anger at the "unjust" way that so many people — 86 — had lost their lives. The fire was the deadliest wildfire in Europe since 1900, according to the International Disaster Database run by the Centre for the Research on the Epidemiology of Disasters in Brussels. "My sorrow is great as is my rage for those who left people to burn to death so unjustly," she said. "I hope that those who died are in heaven and I thank you Father Spyridon for all that you have offered us." Greece's public order minister continued to defend authorities' response to Monday's blaze. Minister Nikos Toskas told state broadcaster ERT it was impossible to evacuate the area's 15,000 people in the 90 minutes that Monday's blaze roared through the area. In more sad news, the bodies of twin girls who their father initially believed had survived the fire have been identified, private investigator George Tsoukalis told the AP. He said nine-year-old twins Sophia and Vasiliki Philipopoulos were found in the arms of their grandparents, who also perished in the fire. A day after the fire, Yiannis Philipopoulos issued a public appeal to try to locate his missing daughters, saying that he had spotted them alive in TV news footage among a group of people getting off a fishing boat that had rescued them. The twins' tragic death was also confirmed by Smile of the Child, an independent child welfare agency that also confirmed the death of 13-year-old Dimitris Alexopoulos, whose body was among those found by firefighters. Coroner Nikolaos Kalogrias told the AP that identification of the fire remains continues at a steady pace. Greek authorities haven't given an account of exactly how many people are still missing. Toskas said fire crews did all they could to save as many lives as possible, but that town planning errors over the last 60 years had created conditions that made it difficult for fire crews to do their job. Toskas said over half of buildings in the Mati area, 30 kilometers (19 miles) east of Athens, were constructed without permits. In addition, some beaches were fenced off, blocking people fleeing the flames from reaching the water. He said the government's priority now is to take measures so that something like this never happens again. Toskas did not appear to heed the call of his boss, Prime Minister Alexis Tsipras, to follow his lead in accepting political responsibility for the disaster. But locals in the stricken resort of Mati were unimpressed by Tsipras' declaration. "I want to know what 'I accept political responsibility' means ... Will he go to jail? What's the payback?" Vissarion Pantelides, 79, said Saturday.